We often look forward, left and right, lively or on the bright side – but how about trying a new perspective? The theme for this month’s CBBH Photo Challenge is LOOKING DOWN. Tell me what you see. SPOILER: SCROLL DOWN FOR DETAILS OF HOW TO GET MY $25 THANK YOU GIFT – FOR EACH ONE OF YOU! I’ve just returned home after spending ten days in Portugal, split between the cities of Porto and Lisbon, so my photos for this month’s CBBH Challenge are all from this trip. 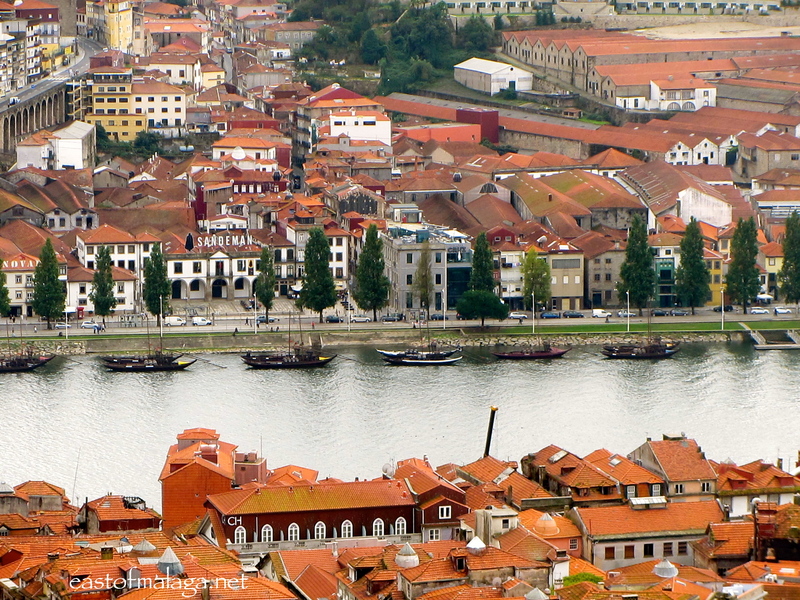 The first photo was taken from the top of the Torre Dos Clérigos in Porto. The views across the city are spectacular and here you can see the famous Sandeman Port Cellars on the other side of the River Douro. This was my view looking down from the iconic Dom Luis I bridge, spanning the River Douro. 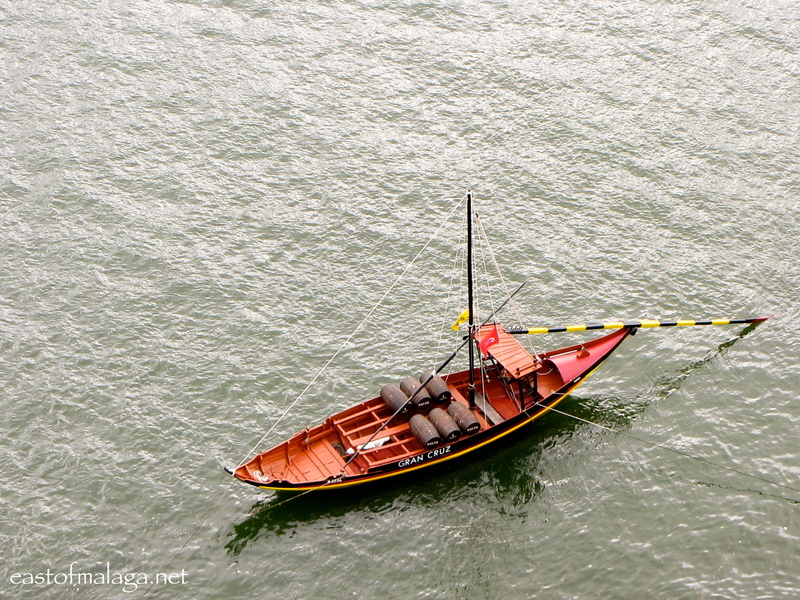 Here you can see one of the rabelo boats – traditional Portugese cargo boats used for transporting goods and people along the river. These boats do not not exist in any other place of the world and their history is closely linked to the production and trade of port wine. 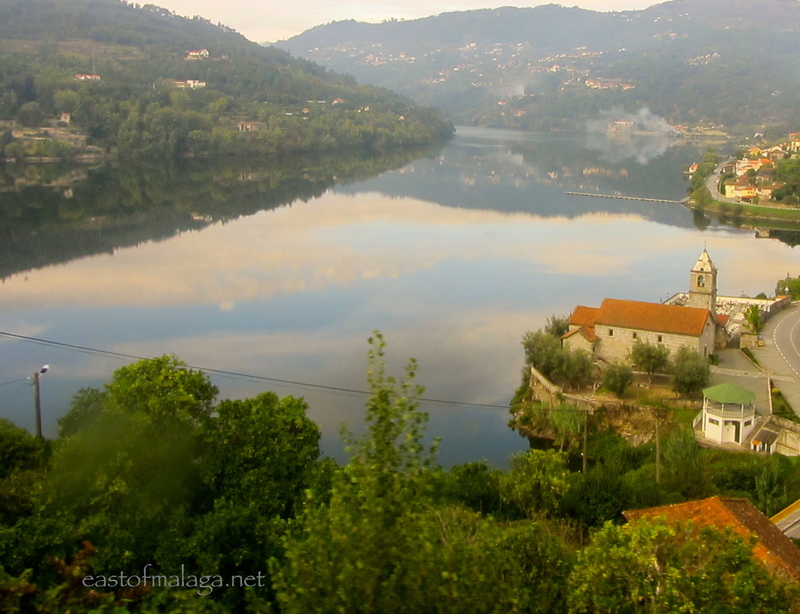 During my stay, I was fortunate to take a train ride into the Douro Valley wine region. The Douro river route is surely one of the great European journeys, as well as being one of the most scenic – a 200 kilometre ride or stately cruise from Porto all the way to the Spanish border. This was my view looking down the river. Gorgeous, isn’t it? After riding to the top, I got the chance to capture the view looking down the 45 metre shaft of the Elevador de Santa Justa, the only remaining vertical, urban lift in the city of Lisbon. 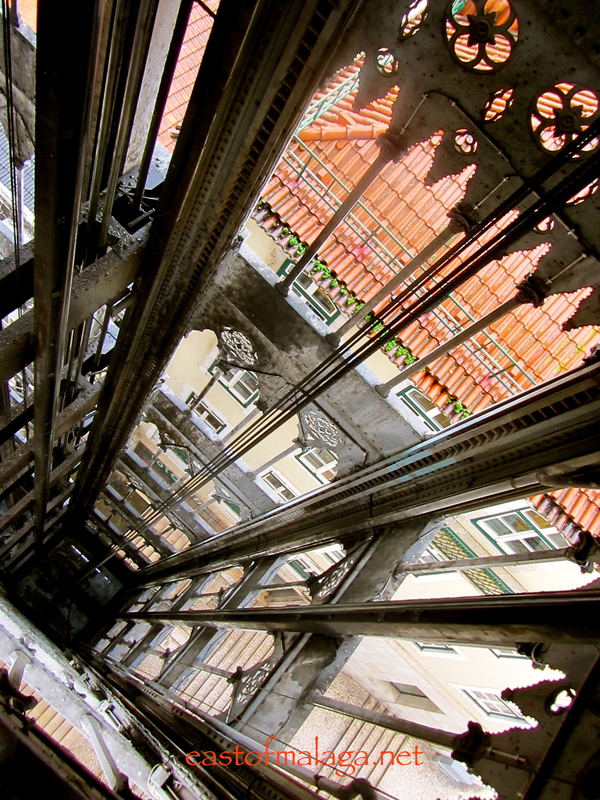 At one time steam-powered, the lift connects the lower streets of the Baixa district with the higher Largo do Carmo. 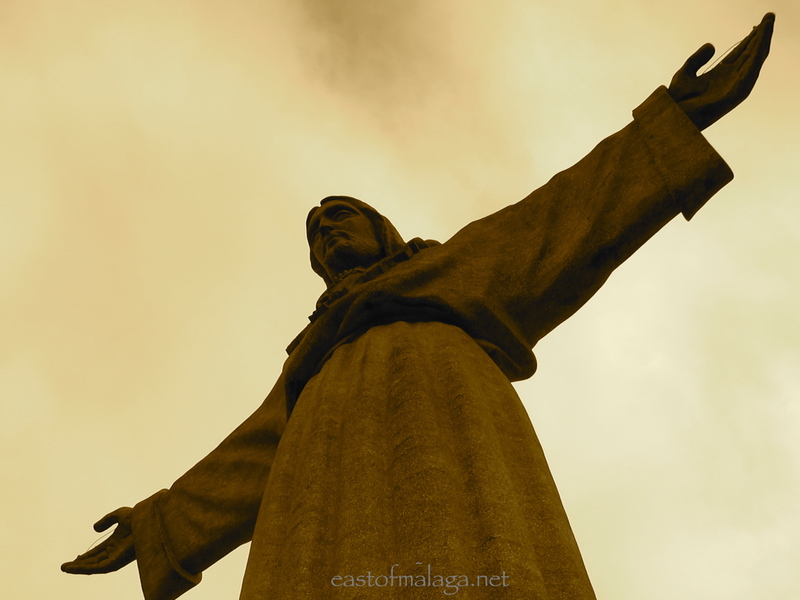 The Christ the King statue is a Catholic monument and shrine looking down over the city of Lisbon. Inspired by the Christ the Redeemer statue in Rio de Janeiro, Brazil, Cristo-Rei was erected to symbolize gratitude that the Portuguese were spared the effects of World War II. *** Sandra Danby is a writer and journalist living in a secret valley in the heart of the Spanish countryside. 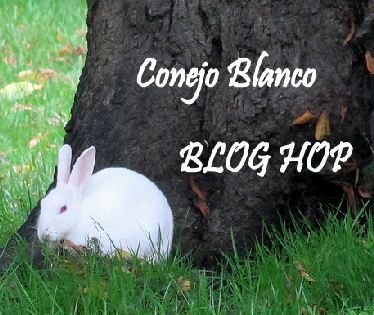 Her blog, Notes on a Spanish Valley, paints a vivid picture with tales of her daily feast of nature, wildlife and food, surrounded by wild land, olive groves and forests of encima oak trees grazed by Iberian black pigs. I love Sandra’s recipes including Spanish “bruschetta” for tea and sweet, home-grown stewed plums for breakfast. Another great feature of each of the posts on Notes on a Spanish Valley is the “5 to remember” – five useful Spanish words associated with the post. It’s always good to learn new Spanish words. Why not hop over and say HOLA?! *** I make no excuse for once again featuring Kiva, a non-profit organization close to my heart, with a mission to connect people through lending, to alleviate poverty. Leveraging the internet and a worldwide network of microfinance institutions, Kiva lets individuals lend as little as $25 to help create opportunity around the world. Learn more about how it works. Kiva gives you the chance to make small loans to borrowers working to start businesses and improve their lives. I’m already a Kiva lender and as a way of saying thank you for your support of my blog, I WOULD LIKE TO OFFER YOU A $25 FREE TRIAL. To redeem your Free Trial all you have to do is CLICK THIS LINK and choose who to lend your money to – BUT HURRY – THERE IS A LIMITED NUMBER OF FREE TRIALS. IT WON’T COST YOU A PENNY – I PROMISE! Kiva will notify me if any of my readers take up a Free Trial, but I’d love you to still let me know in the Comment section, below. TOGETHER, LET’S TRY TO MAKE A DIFFERENCE THIS MONTH! So that´s the CBBH Photo Challenge for November, everyone! 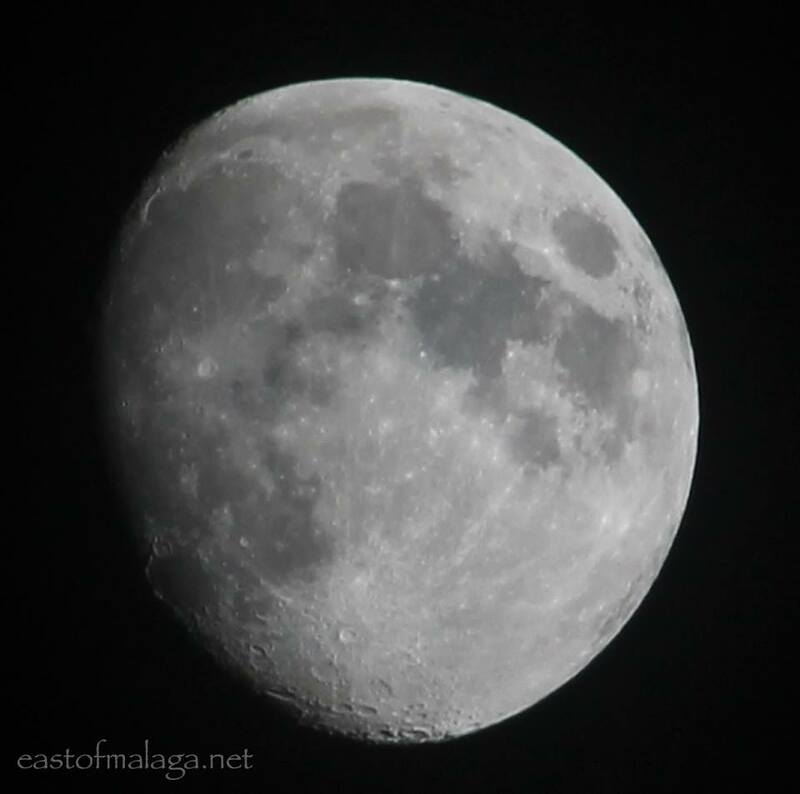 This entry was tagged Andalucía, CBBH, CBBH Photo Challenge, East of Malaga, Europe, Lisbon, Malaga, moon, photography, Porto, Portugal, Spain, travel. Bookmark the permalink. OOHHHHH cool pix, Jo! Dangerous creatures but strangely beautiful. I can understand your fascination. Great entry, Debbie – well done! Thanks for sharing two links, neither of which I know – I’ve just been to visit them both. Amazing! They have only just introduced a fee for the entrance to Parc Guell, so that might have been why it was quiet. Great photos, Jo – I know what you mean about the bright sunlight – it seems to affect so many of my photos, too. I LOVE, love, love Gaudi and Barcelona. Here’s my contribution to ‘Looking Down’. I particularly love the photography of both blogs I recommend too, so please check them out. Sounds and looks like paradise, Sandra. I love the sound of water in whatever form – I find it very soothing. Love One Cool Site – so useful, so I’ll hop over to your other link … right away! I got dizzy looking at the photo of Elevador de Santa Justa. Now, that means that you captured it perfectly. The Christ of King statue is something I’ve always wanted to see. It’s magnificent. All the photos are certainly looking down. I have to search my photos and find something to submit for the challenge. Thanks for having these challenges. They really get me thinking. I’d love you to join in with this month’s challenge, Issy. You’re right, they get ME thinking, too! I love the theme and the pics, from both perspectives of looking down. My favourite is where it meets it the middle on the Douro river, looking down to the water and to the sky. It’s always good to try to look at things from different perspectives, don’t you think? The boat shot from the Dom Lois bridge is absolutely stunning! As is the one of the elevator! Wow! Love this! Hopefully I can get a few shots for this month’s theme. Tomorrow I am going to NYC so I don’t think I will get any “looking down” shots there. Haha. Go to the Top of the Rock, and “look down” over Central Park! They are probably my two favourites from this group, too, Sylvia. Breathtaking shots, Marianne! The Elevador de Santa Justa photo is stunning! Great theme, I’ll be back later.. I love your photos, great colour. You almost always catch me by surprise, Marianne, and this month more so than ever! I’m really excited because my daughter’s arriving this afternoon and on Sunday I’m off to Barcelona for 5 nights. Too excited to function very well!